Detectives probing the murder of a 77-year-old woman in her home have sent mobile phone appeals with a picture of a man they want to talk to. 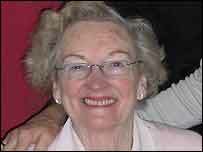 Georgina Edmonds was found dead by her son at her home in Kiln Lane in Brambridge, Hampshire, on 11 January. The appeal was sent to phones with Bluetooth technology within a 100m radius of a transmitter in a police car patrolling Eastleigh last Friday. More than 225 people received the message between 1800 and 2100 GMT. The picture featured a man using Mrs Edmonds' bank card at the cash machine at Tesco Express, Twyford Road, Eastleigh, at around 2240 GMT on the day she was killed. Earlier, murder squad detectives revealed they had discovered Mrs Edmonds' mobile phone as they searched a path that runs along the River Itchen. They also released a map showing a number of people they want to talk to, who were seen in the area on the day the mother-of-two was killed. Det Ch Insp Paul Barton, of Hampshire Constabulary, said: "Bluetooth messaging is particularly good at reaching sections of the community that don't access traditional marketing campaigns, such as young people." Mrs Edmonds' daughter returned to England from working as a nurse in Kenya and Sudan to appeal for help in finding her mother's killer. A distinctive key fob, Mrs Edmonds' cash card, cheque book and handbag have all been missing since the killing. Four men were arrested on 14 January. Three were released without charge while a 37-year-old man was released on bail. Post-mortem tests showed Mrs Edmonds died of extensive head injuries. An inquest into her death was due to open.